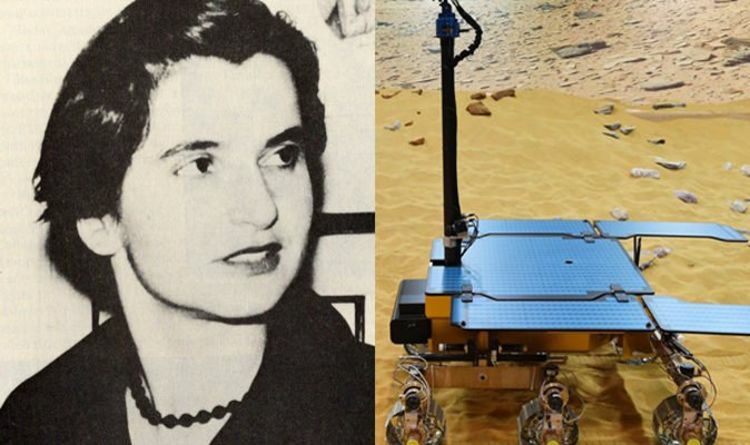 Home / غير مصنف / Rosalind Franklin: NASA Mars rover named after pioneer - Who was Rosalind Franklin? 2020 will be an important year for space exploration. NASA has scheduled not one but two Mars rovers to travel the 34 million miles towards the Red Planet. And today, one of these ExoMars rovers received a name – Rosalind Franklin. The ExoMars rovers are an audacious attempt to conclusively prove the existence of life on Mars. A growing scientific consensus believe the Red Planet’s apparently inhospitable exterior might well be concealing evidence of alien life past and present. Some scientists think a thick layer of permafrost may be sheltering tiny, organic molecules. And one of the ExoMars rovers will drill through to where this organic layer is believed to exist. One of the ExoMars rovers being sent to Mars next year will bear the name of DNA pioneer Rosalind Franklin. The honour follows a public call for suggestions that drew 36,000 responses. Astronaut Tim Peake unveiled the name near to the Airbus factory in Stevenage, UK, where the ExoMars rover is being constructed. Rosalind Franklin had a vital role in the discovery of the structure of deoxyribonucleic acid, more commonly known by its abbreviation DNA. It was Rosalind Franklin’s X-ray images that enabled her colleagues James Watson and Francis Crick to decipher its iconic double-helix shape. Franklin's early death from ovarian cancer aged just 37, meant she never tragically received the recognition lauded on her male colleagues. "In the last year of Rosalind's life, I remember visiting her in hospital on the day when she was excited by the news of the Soviet Sputnik satellite - the very beginning of space exploration," Franklin's sister, Jenifer Glynn, said. The six-wheeled ExoMars rover will not land on the Martian surface until 2021. The Rosalind Franklin ExoMars rover will be laden with cutting-edge scientific tools to probe the Red Planet, including a powerful drill, a next-generation radar and an organic molecule analyser. The ExoMars programme is, in fact already underway. An orbiter has been exploring the gases emitted from Mars’ atmosphere for the past two years. Part scientist, part messenger service and part delivery-bot, the orbiter carried the ill-fated Schiaparelli lander in tow on its journey to Mars. But Schiaparelli crash-landed, ending its Mars mission in October 2016. US space agency NASA will launch another, as yet unnamed, rover next year. This project has also encountered difficulties, with NASA announcing a failed heat shield test, although this should not delay the rover’s launch. Paul Meacham, lead systems engineer on the ExoMars rover project, said: “A lot of the scientific results from these missions will then actually direct where a human mission might go and who we might send on a mission like that. Will we send a biologist or a geologist? Or both?